For those who are confused why the shutdown happened, here is a New York Times graphic showing the spending bill that was bounced back and forth between the Senate and the House, and the lack of resolution on the future budget led to the shutdown. For those who are curious as to which agencies specifically are affected and how many people will be furloughed, here’s a CNN searchable interactive list of all agencies affected, with numbers of furloughed listed as well. P.S. When I first saw that NY Times picture (posted above), I thought I saw a picture of a guard precariously balancing on guard rails. Approximate two hours ago, at midnight, as the U.S. congress was unable to reach a resolution in passing the budget, a shutdown of the government happened, furloughing some 800,000 government workers and shuttering some non-essential agencies and services. That is repeated ad nauseum; what’s interesting is: how are the two polarised news sources — MSNBC on the left, and Fox News on the right — reporting this brouhaha? 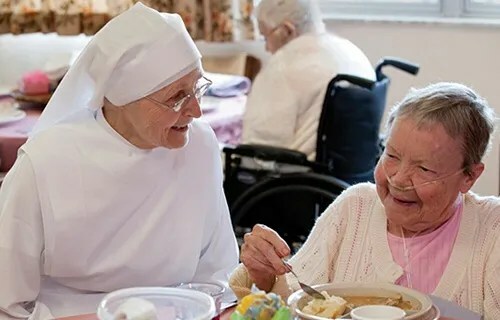 For those not in the know, the Republican-held House in the Congress has been largely blamed for being unwilling to pass the budget without trying to force through language that aims to strip the Affordable Care Act, also popularly known as “Obamacare,” from the bill. 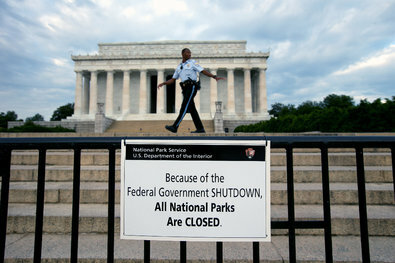 Fox News has reported that lawmakers have “missed the deadline,” emphasising that the shutdown would “limit access to national monuments, parks,” and how the shutdown might impact travellers. 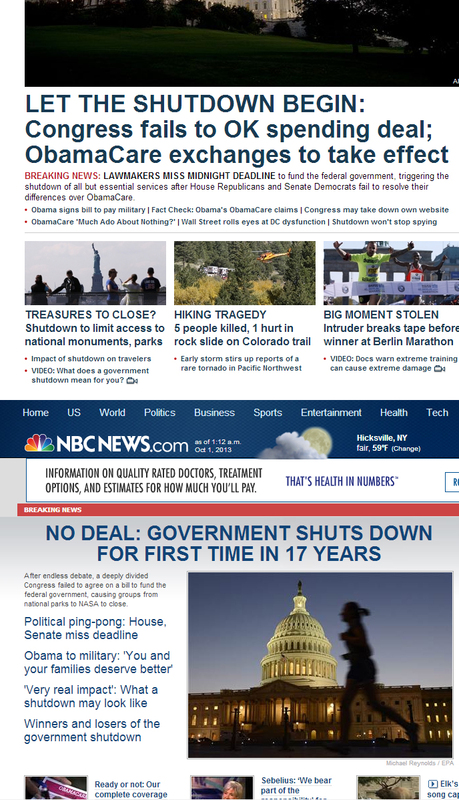 MSNBC, on the other hand, of course, was all “First shutdown in 17 years!” and various iterations of how the shutdown is impending doomsday.